Note: The procedure below applies if you are importing data to a new Account-based List. You can also import data in the following ways. Be sure to follow the correct procedure for the import path you want. If you are an admin for your Organization, you can use the SalesforceIQ import tool to import data from an external system to a new List you create in SalesforceIQ. Our tool walks you through formatting your file correctly to import Contacts, Accounts, and List-specific items such as opportunities or leads. Imports are only accessible in a Chrome browser. The new List name cannot be Owner or Owners. To help ensure a smooth data import, format your data following the guidelines in Formatting data for import into SalesforceIQ. 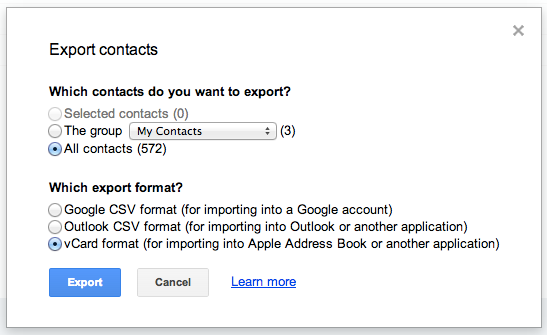 Be sure to include an email address for any Contacts you import. This ensures that communication activity for that Contact appears in the Stream. As part of the import process, you can map your existing data fields to Contact properties and Account properties in SalesforceIQ. Learn more about Contact properties here. Learn more about Account properties for all users here, and about Account property information specific to admin users here. Note: We recommend that you import Account properties only if they truly represent Account-level data. You can always build out Account properties after the import. 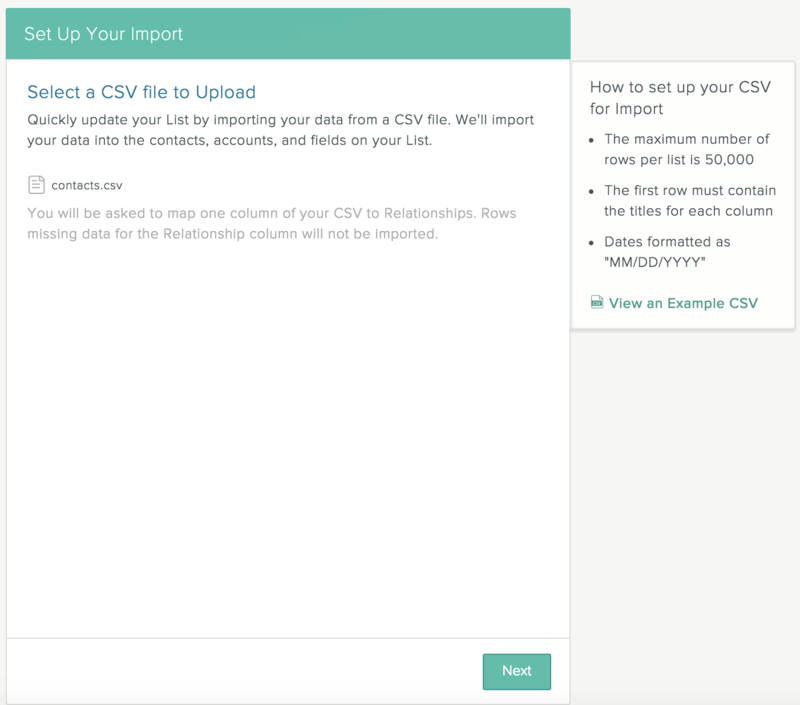 Export your data to a CSV file. In SalesforceIQ, click at the top of the screen, and then select Settings. On the screen that appears, click Lists, and then click Import List in the upper-right corner. Drag the file into the Select a CSV file to Upload field, or click Choose File and browse to the file on your computer. 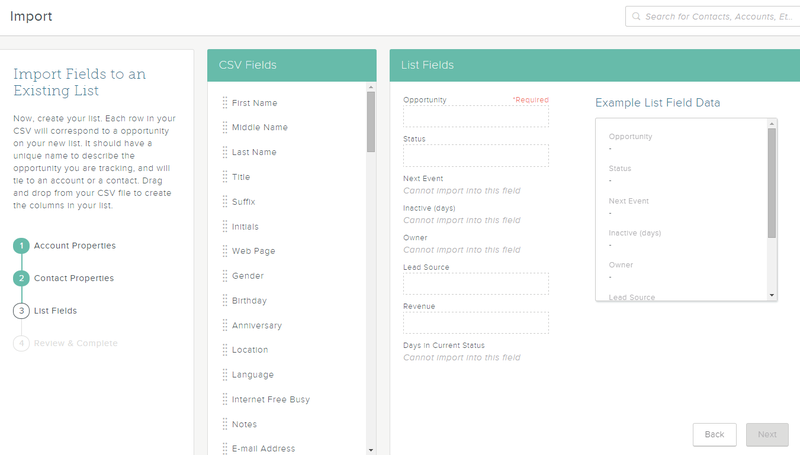 Enter the plural and singular forms of the items you want to track on the new List (leads, opportunities, etc.). The plural form becomes the new List name. Select Accounts as the List type and click Next. 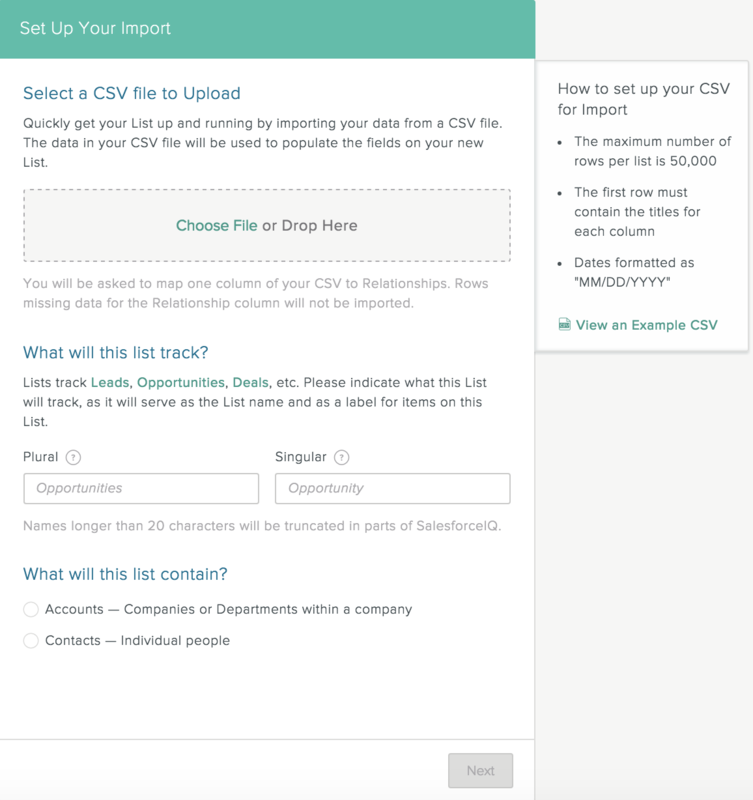 Note: The CSV import screen contains information on the correct format for your CSV file. 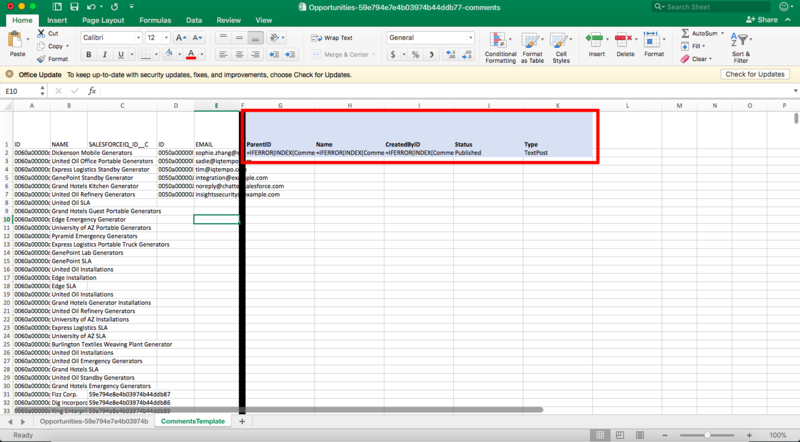 To see a template of the recommended CSV file format, click View an Example CSV. A series of informational screens appears explaining the three steps of the import process: Importing Account properties, importing Contact properties, and importing List fields. Please review the information before clicking Next. On the Import Account Properties screen, as well the import screens that follow, the field headers from your CSV file appear as a list on the left. Drag a header into a blank field on the right to enter that value in the field. The right section of each import screen shows a preview of how your entries will appear in SalesforceIQ. When you are finished entering values, click Next. 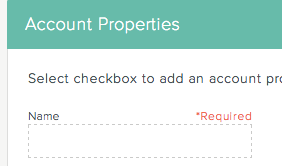 Note: For an Accounts List, importing Account properties is required. At a minimum, you must enter a name for the Account by dragging an item into the Name field. On the Import Contact Properties screen, drag a header on the left into a blank field on the right to enter that value in the field. When you are finished entering values, click Next. For an Account list, this step is optional and you can Skip it. Note: If you choose to import Contact properties, you must populate the Name field to change the Skip button to Next. On the Import Fields to a New List screen, drag a header on the left into a blank field on the right to enter that value in the field. Each field you import becomes a field in your List. When you are finished entering values, click Next. Note: Importing fields to a new List is required. At a minimum, you must import a value such as an individual, company, or deal name to the first field displayed on the right—the field that indicates what type of object (lead, opportunity, etc.) you are tracking on this List. If your CSV file contains any duplicate entries, a screen appears asking whether you want to merge them. 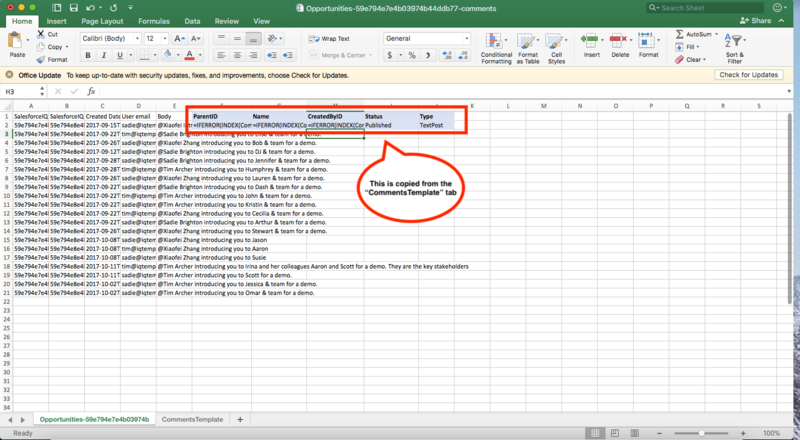 If you don't merge the entries, the import process creates a new List object for each entry in the CSV file. If you choose to merge the entries, the import process first merges them into a single entry in the CSV file, and then creates a single List object from the merged entry. Merging the entries impacts the CSV file only—it doesn't merge the entries with any existing object on the List. Note: If you are importing to an Account that already exists in your Account gallery, the Account property data in this import will overwrite existing Account properties. For example, say you have the Avocado, Inc. Account in your Account gallery. The Industry Account property is Tech. Now assume your data to be imported also contains an Avocado, Inc. Account, but this time the Industry Account property is Storage. After the import, the Avocado, Inc. Account will have the Industry Account property set as Storage. Review your information on the Review and Complete Your Import screen. If you want to change any entries, click to the right of the appropriate section. When you are happy with your import settings, click Complete Import. Note: The procedure below applies if you are importing data to an existing Account-based List. You can also import data in the following ways. Be sure to follow the correct procedure for the import path you want. If you are an admin for an Organization, you can use the SalesforceIQ import tool to import data from an external system to an existing List. Our tool walks you through formatting your file correctly to import Contacts, Accounts, and List-specific items such as opportunities or leads. If a List reaches 50,000 objects, you can no longer import data into the List. You can, however, continue to add items to the List manually. Any fields you want to import into an existing List must already exist in the List. Learn how to add fields to a List. 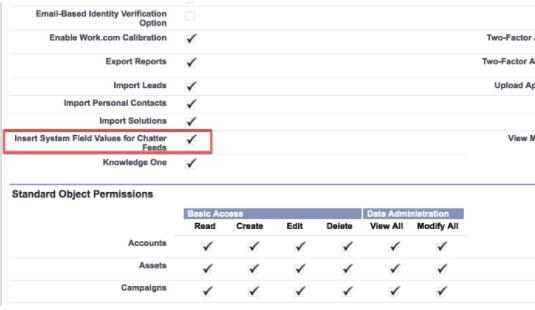 In SalesforceIQ, open the Accounts List into which you want to import the data. Click the List name at the top of the screen, and then select Import. 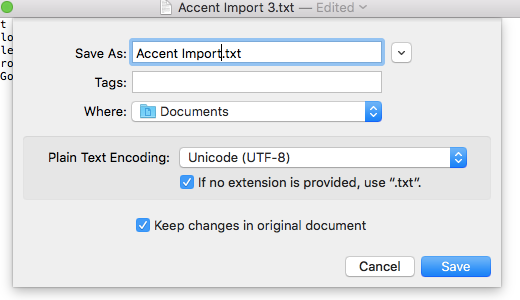 To import your CSV file, drag the file into the Select a CSV file to Upload field, or click Choose File and browse to the file on your computer, and then click Next. Importing fields to a List is required. 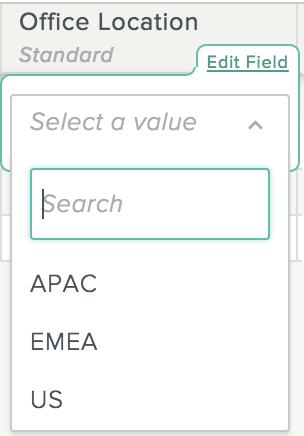 At a minimum, you must import a value such as an individual, company, or deal name to the first field displayed on the right—the field that indicates what type of object (lead, opportunity, etc.) you are tracking on this List. 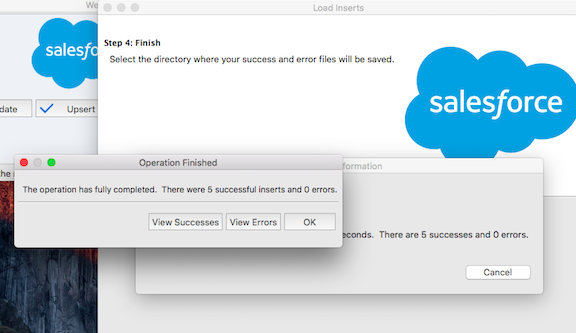 Note: If you import a List object that already exists in the List, SalesforceIQ creates a second List entry with the same List object name to avoid overwriting any data. The fields available for import are the ones from your existing List. Note: The procedure below applies if you are importing data to a new Contact-based List. You can also import data in the following ways. Be sure to follow the correct procedure for the import path you want. 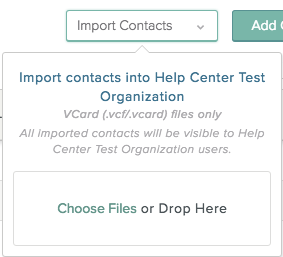 Enter the plural and singular forms of the type of Contact you want to track on the new List. The plural form becomes the new List name. Select Contacts as the List type and click Next. A series of informational screens appears explaining the three steps of the import process: Importing Contact properties, importing Account properties, and importing List fields. Please review the information before clicking Next. 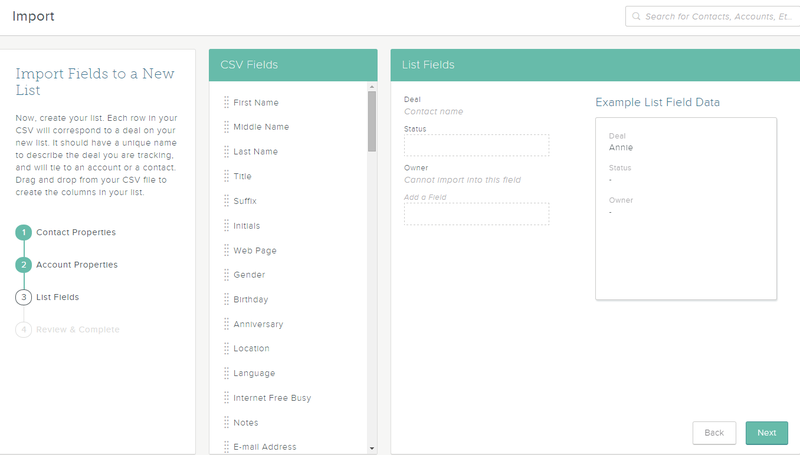 On the Import Contact Properties screen, as well the import screens that follow, the field headers from your CSV file appear as a list on the left. Drag a header into a blank field on the right to enter that value in the field. The right section of each import screen shows a preview of how your entries will appear in SalesforceIQ. When you are finished entering values, click Next. Note: For a Contacts List, importing Contact properties is required. At a minimum, you must populate the Name field. On the Import Account Properties screen, drag a header on the left into a blank field on the right to enter that value in the field. When you are finished entering values, click Next. Note: For a Contacts List, importing Account properties is optional. If you choose to import Account properties, you must populate the Name field to change the Skip button to Next. On the Import Fields to a New List screen, drag a header on the left into a blank field on the right to enter that value in the field. Each field you import becomes a field in your List. When you are finished entering values, click Next. Note: The contact you entered on the Import Contact Properties screen is automatically entered as the List object name. Note: The procedure below applies if you are importing data to an existing Contact-based List. You can also import data in the following ways. Be sure to follow the correct procedure for the import path you want. 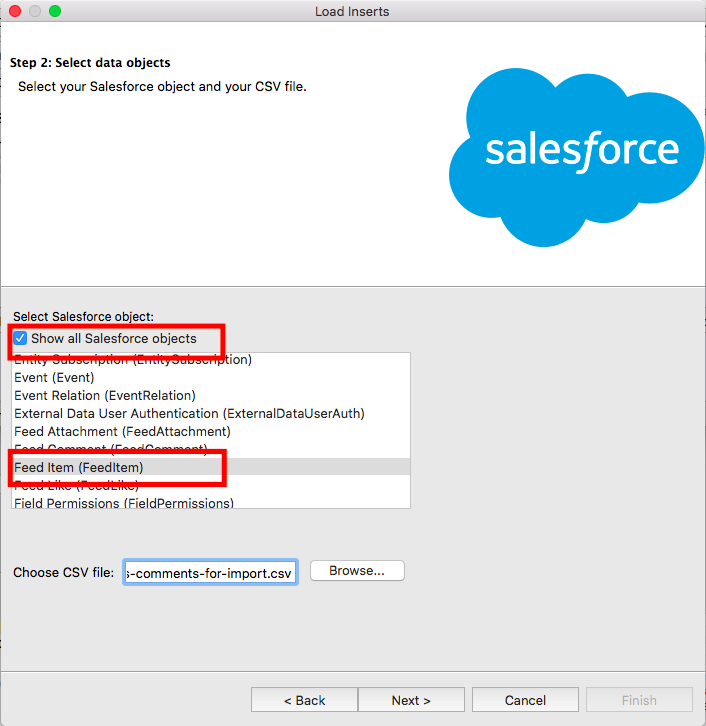 In SalesforceIQ, open the List into which you want to import the data. 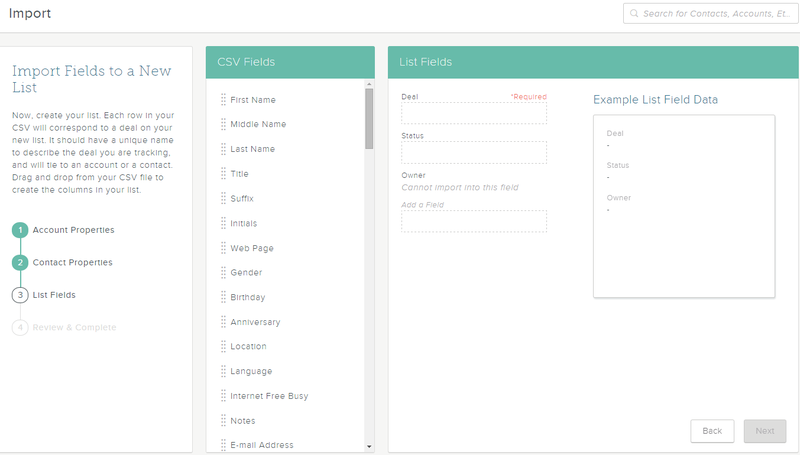 On Import Contact Properties screen, as well the import screens that follow, the field headers from your CSV file appear as a list on the left. Drag a header into a blank field on the right to enter that value in the field. The right section of each import screen shows a preview of how your entries will appear in SalesforceIQ. When you are finished entering values, click Next. Note: For a Contacts List, importing Contact properties is required. At a minimum, you must enter a name dragging an item into the Name field. Note: If you import a List object that already exists in the List, SalesforceIQ creates a second List entry with the same object name to avoid overwriting any data. SalesforceIQ offers a variety of options that make it easy for users to migrate data from an external system into SalesforceIQ. Here is an overview of those options and some considerations for using them. Importing data to a List—SalesforceIQ offers an easy tool that allows admin users to import existing customer data into a List in SalesforceIQ. The tool walks you through formatting your file correctly to import Contacts, Accounts, and List-specific items such as opportunities or leads. An admin user can import data either to a new List the admin creates in SalesforceIQ or to any existing List in the Organization. 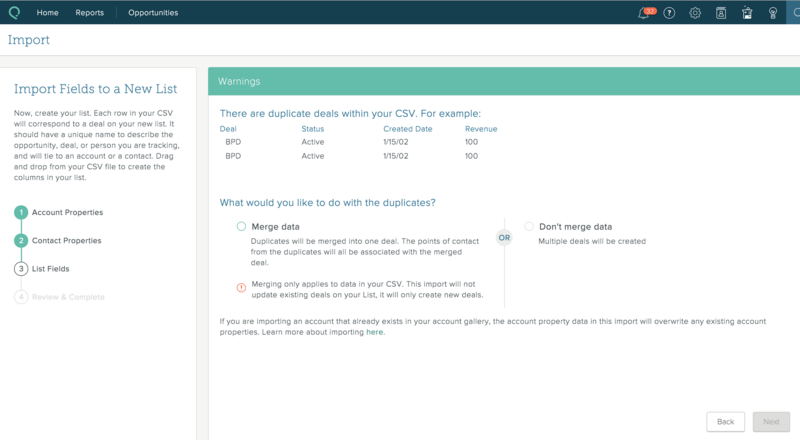 Migrating your data from Sales Cloud to SalesforceIQ—Depending on your Sales Cloud edition, you can use prebuilt or custom-built reports to migrate your data into SalesforceIQ. Importing Contacts—Any user can import Contacts from an external system to their SalesforceIQ Contact Gallery. 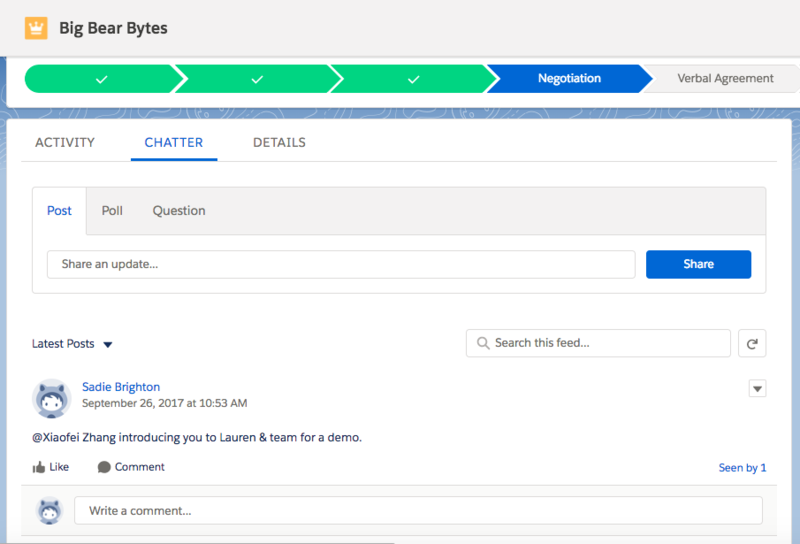 Capturing communication activity that is in the other system before you create your SalesforceIQ Account—If your email and calendar events are hosted in Google Apps, our system syncs existing emails and calendar events up to six months old. If you're hosted on Exchange, we sync emails up to two years old. Learn more about our Sharing model and how to share communication. Here are the high-level steps for importing your SalesforceIQ activity after migrating to Sales Cloud. If you just want to migrate to Sales Cloud without importing activity, follow these steps instead. * Note: This import process will work for Sales Cloud Professional Edition or Sales Cloud Enterprise Edition only. Have your team stop manually logging activity into your SalesforceIQ Organization. 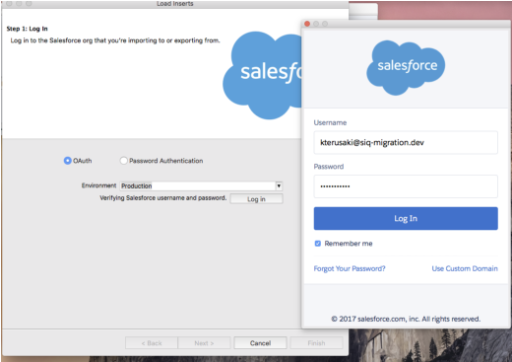 Migrate your data using the SalesforceIQ migration tool. This migrates Lists, Contacts, and Accounts. Ensure that all users that were in SalesforceIQ have a user record in Salesforce. This step is required if you want the author of Stream comments to be the author of the respective chatter comment. Marry the exported data files. This article is for customers who have already migrated their data from SalesforceIQ CRM into Sales Cloud, and are looking to import their SalesforceIQ comments into Sales Cloud. Review these high-level steps for how to import SalesforceIQ data into Sales Cloud after you have completed the data transfer into Sales Cloud. *Note: This example is focused on importing comments from the Opportunities List in SalesforceIQ to the Opportunities Object in Sales Cloud. The general process applies to importing into other Objects in Sales Cloud. You must be a System Administrator in both SalesforceIQ and Sales Cloud in order to complete data migrations or imports. Run an export of your Opportunity Object in Sales Cloud via Data Loader, include all fields in the export. 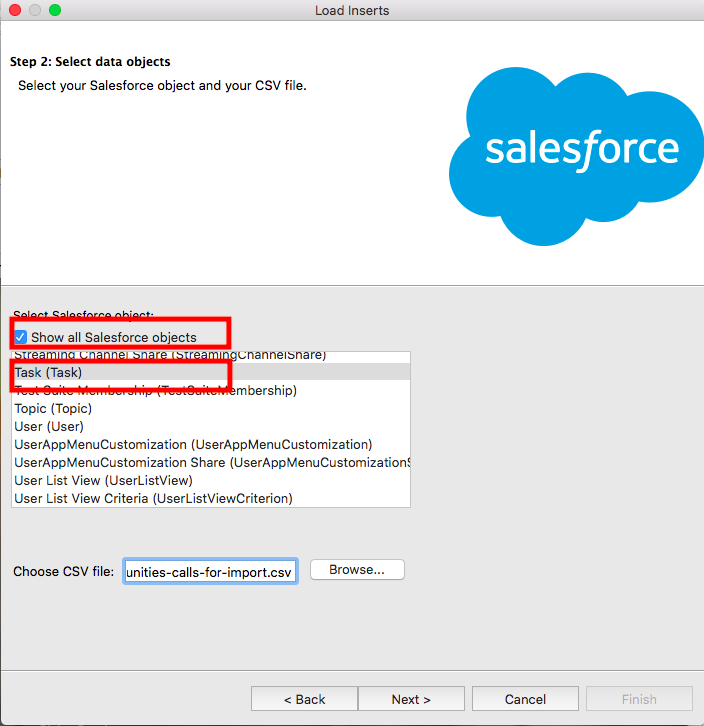 Run an export of your Users Object in Sales Cloud via Data Loader, include all fields in the export. Download and open this template. Then follow the instructions below. 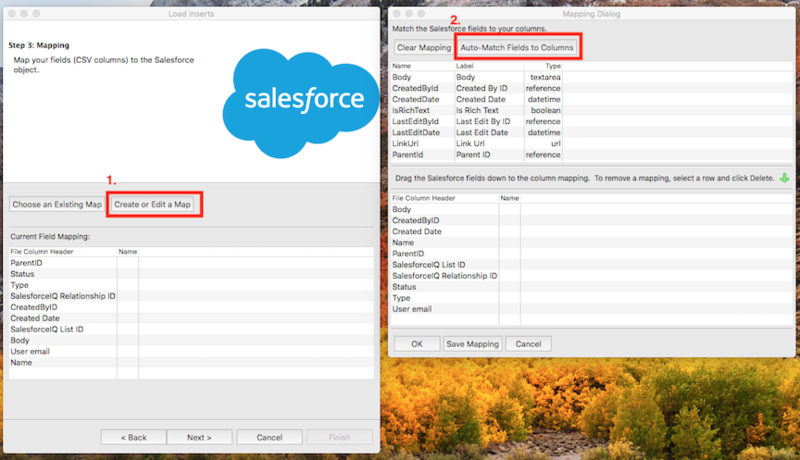 Paste your data in columns A, B and C. Use the data from your Opportunity Object export from Sales Cloud. 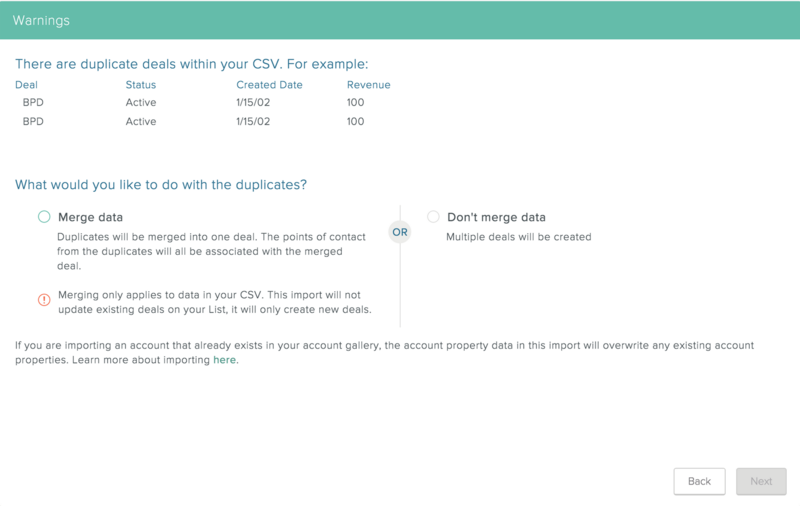 Paste your data in columns D and E. Use the data from your Users export from Sales Cloud. 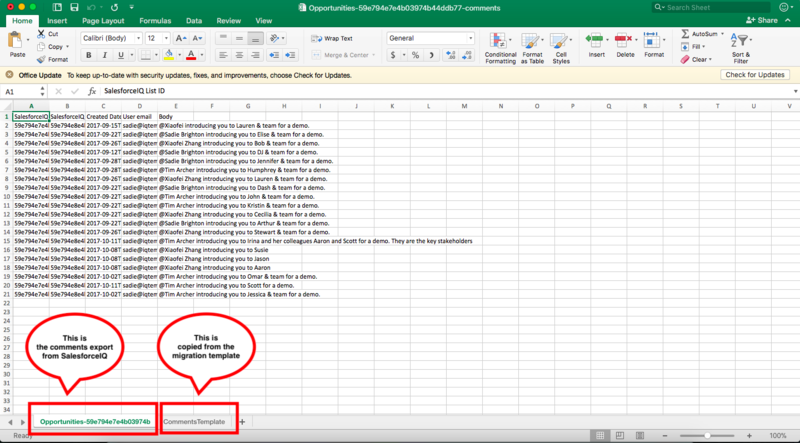 Copy the worksheet tab called "CommentsTemplate", and merge it with the workbook "Opportunities-XXXXXX-comments.csv". It should look like the screenshot below. 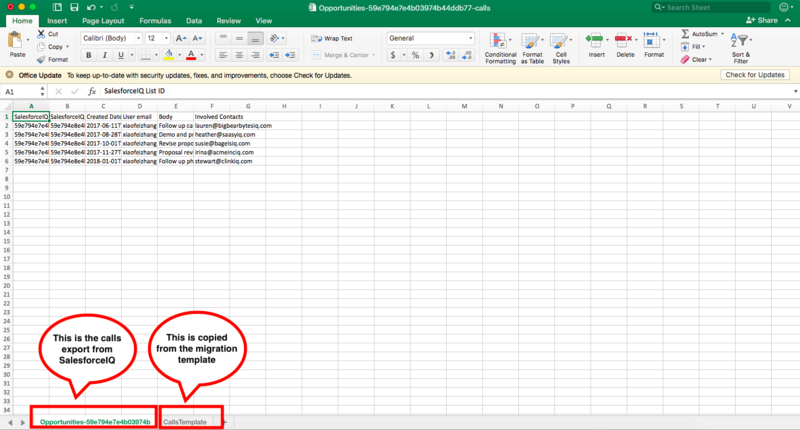 Return to the tab called "CommentsTemplate", copy the table highlighted in blue and paste it as new columns in your tab called "Opportunities-XXXXXX-comments.csv". It should look like screenshots below. 6. To activate the formula fields, double-click on Row 2 in the columns (the blue fields) and delete the special character, an apostrophe ('), located at the very beginning of the formula. 7. Then click into the formula field, on Row 2 in each column, and drag down the formula fields and fixed value fields to all applicable rows within your data set. 8. Once the formula has populated for the whole column, you then need to copy each of the formula ID columns and paste special as Value. Highlight all of the columns and right click to select copy, then right click again, and select the ‘Paste Special’ option, choose ‘Value’ and click OK.
A finished version of this, with proper formatting can be found HERE, for your reference. Open Data Loader and click Insert. Log into Salesforce as a System Administrator user. Check the 'Show all Salesforce objects' box and select 'Feed Item (FeedItem)'. Browse for your final import file, titled "Opportunity-comments-for-import.csv" and click 'Next'. 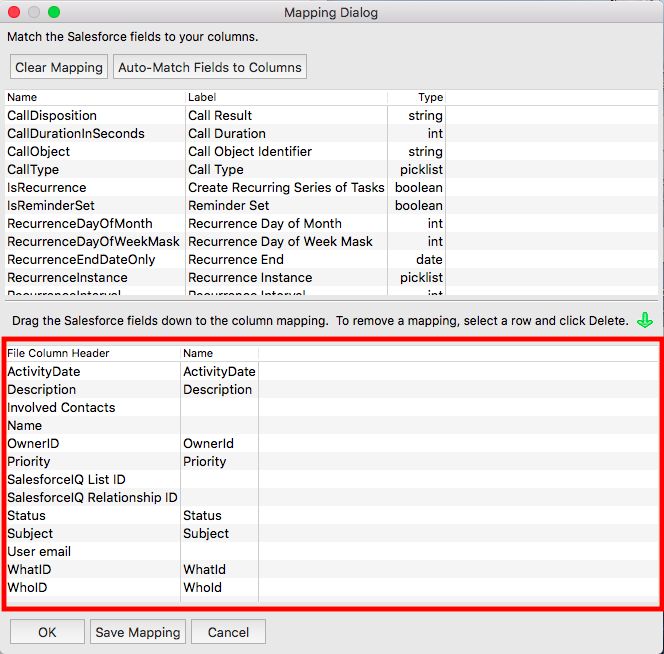 Click 'Create or Edit Map', and then click 'Auto-Match Fields to Columns'. 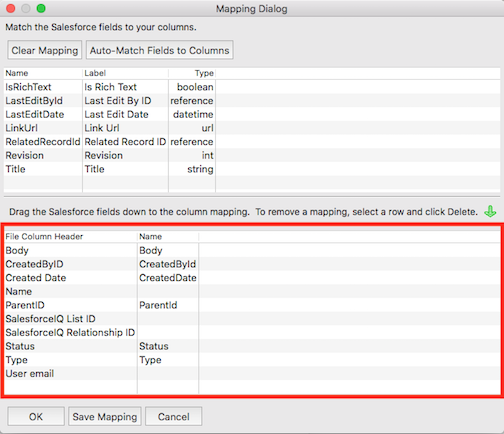 Once you 'Auto-Match Fields to Columns', you should see something like the following screenshot below. Click OK > Next > Finish. Success and Error logs will be generated after the import is complete (see screenshot below). If you see any errors, click on "View Errors", follow the error logs to correct them. If you need additional assistance on fixing the errors, please contact Salesforce Support. 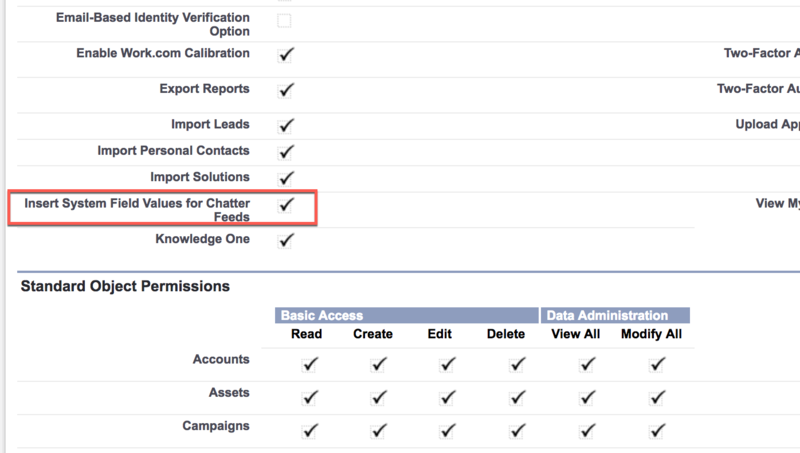 The import comment activities are located in the Chatter section of your Opportunity record. This article is for customers who have already migrated their data from SalesforceIQ CRM into Sales Cloud and are looking to import their SalesforceIQ calls into Sales Cloud. *Note: This example is focused on importing calls from the Opportunities List in SalesforceIQ to the Opportunities Object in Sales Cloud. The general process applies when importing into other Objects in Sales Cloud. 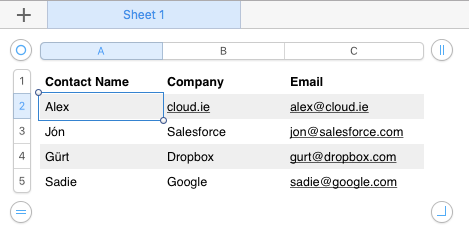 Run an export of your Contacts Object in Sales Cloud via Data Loader, include all fields in the export. 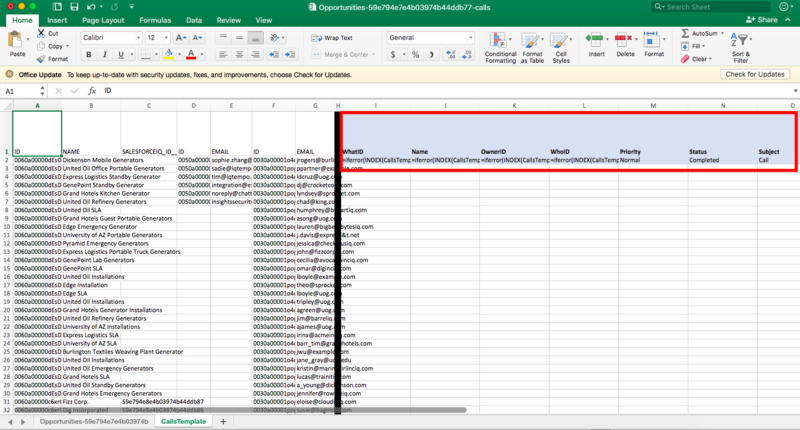 Return to the tab called "CallsTemplate", copy the table highlighted in blue and paste it as new columns in your tab called "Opportunities-XXXXXX-calls.csv". It should look like screenshots below. *Note: These fields contain pre-written formulas or fixed values that will marry/merge the proper Sales Cloud values with your SalesforceIQ calls, allowing you to map your SalesforceIQ calls to the correct opportunity record in Sales Cloud. Do not edit or delete these formulas or fixed values as it will cause errors with your data template and data import. Delete the entire column of "WhoID"
Rename the column header "WhatID" as "WhoID"
To activate these formula fields, double-click on Row 2 in the columns (the blue fields) and delete the special character, an apostrophe ('), located at the very beginning of the formula. Then click into the formula field, on Row 2 in each column, and drag down the formula fields and fixed value fields to all applicable rows within your data set. Rename the column header “Created Date” as "ActivityDate"
Rename the column header “Body” as "Description"
Once the formula has populated for the whole column, you then need to copy each of the formula ID columns and paste special as Value. Highlight all of the columns and right click to select copy, then right click again, and select the ‘Paste Special’ option, choose ‘Value’ and click OK.
Browse for your final import file, titled “Opportunity-calls-for-import.csv” and click Next. 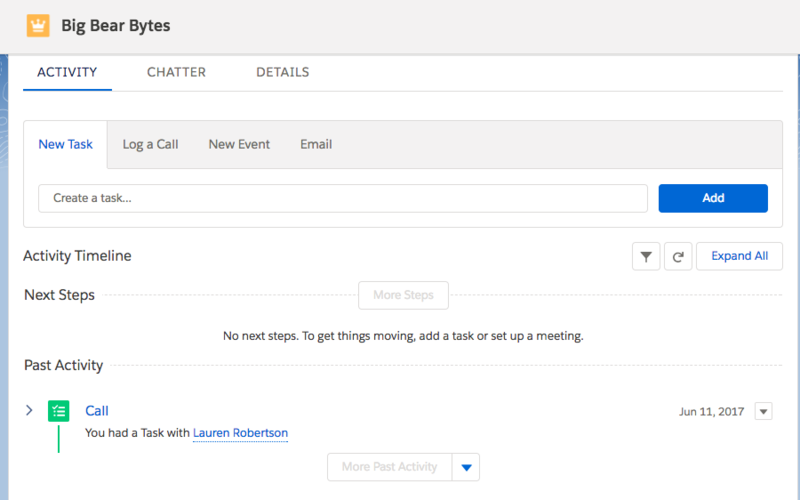 The imported call activities are located in Past Activity section of your Opportunity record. Note: This import process will work for Sales Cloud Professional Edition or Sales Cloud Enterprise Edition only. This article is for customers who have already migrated their data from SalesforceIQ CRM into Sales Cloud and are looking to import their SalesforceIQ meetings into Sales Cloud. *Note: This example is focused on importing meetings from the Opportunities List in SalesforceIQ to the Opportunities Object in Sales Cloud. The general process applies when importing into other Objects in Sales Cloud. 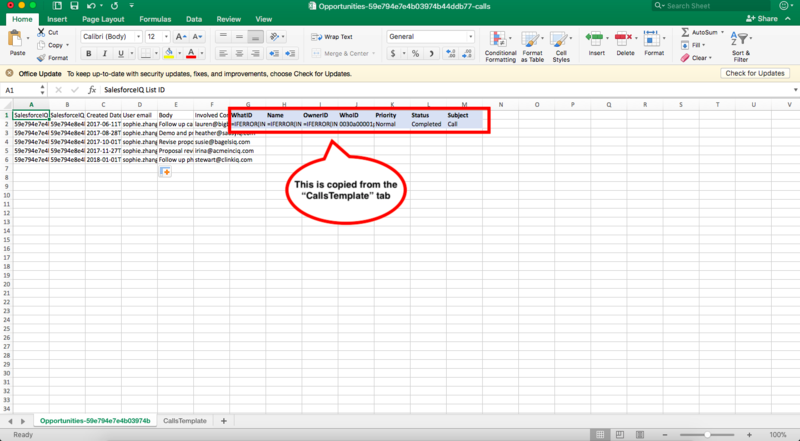 Return to the tab called "MeetingsTemplate", copy the table highlighted in blue and paste it as new columns in your tab called "Opportunities-XXXXXX-meetings.csv". It should look like screenshots below. *Note: These fields contain pre-written formulas or fixed values that will marry/merge the proper Sales Cloud values with your SalesforceIQ meetings, allowing you to map your SalesforceIQ meetings to the correct opportunity record in Sales Cloud. Do not edit or delete these formulas or fixed values as it will cause errors with your data template and data import. Browse for your final import file, titled “Opportunity-meetings-for-import.csv” and click Next. The imported meeting activities are located in Past Activity section of your Opportunity record.